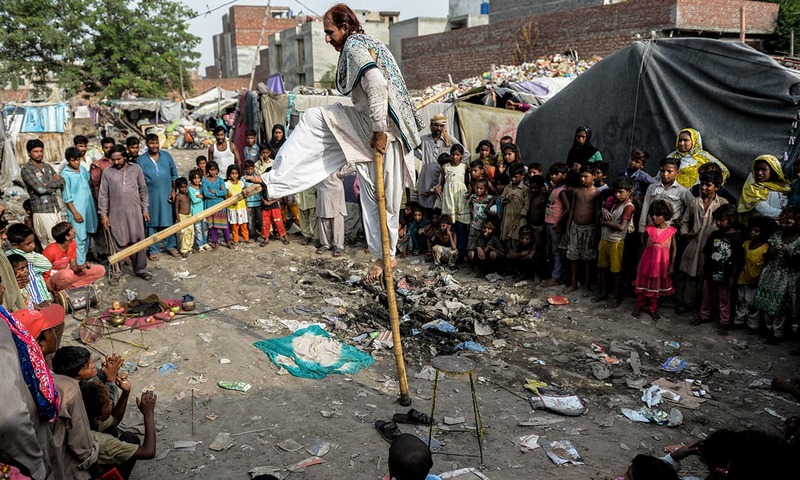 Bahar Ali was five years old when his older brother and uncle started training him to become a street performer. “They would massage my muscles with oil and make me do different exercises so that my body became flexible,” he says sitting on a charpoy in a large slum off Multan Road on the southern edge of Lahore. He has just finished a performance and his white kurta is drenched in sweat. His voice is low – barely audible – and he is so tired that he just wants to go home and sleep. “As you get older you want things to become simple,” he says. On the contrary, this particular performance has been extremely arduous. Bahar Ali, who appears to be in his sixties, had to do tricks that he had not performed for 15 years. Together with his son and a nephew, he tried to pass through a steel ring about one foot in diameter but the trick did not go as planned. The performers got stuck in the ring and managed to get out only with help from the audience members. 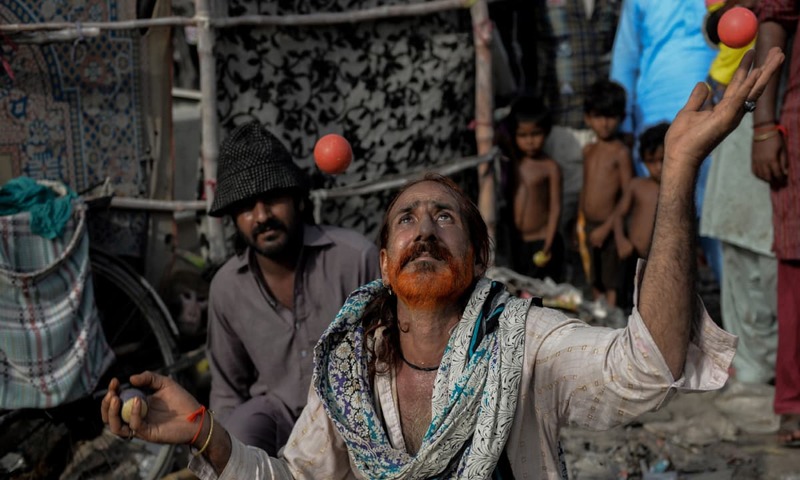 There is consensus among Bahar Ali’s gypsy community – known commonly as qalandars (mendicants) or baazigars (tricksters) – that passing through the ring is one of the hardest tricks to perform. It is usually the final act in a performance — other tricks being a build-up to it. Yet, it is just one of the many body-contorting tasks their forefathers used to perform routinely — such as making a human tower. 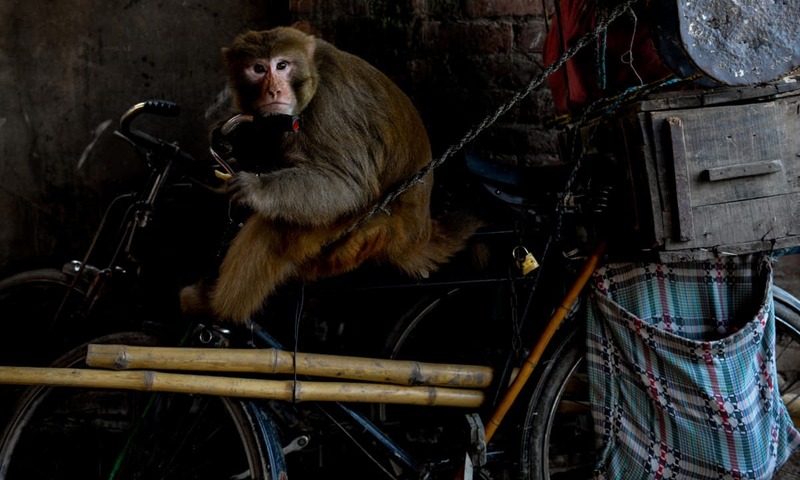 No longer as supple and skilled as their ancestors, many of them have started using monkeys and goats in their street shows. Bahar Ali did the same but all his monkeys died three years ago and he had no option but to go back to performing himself. 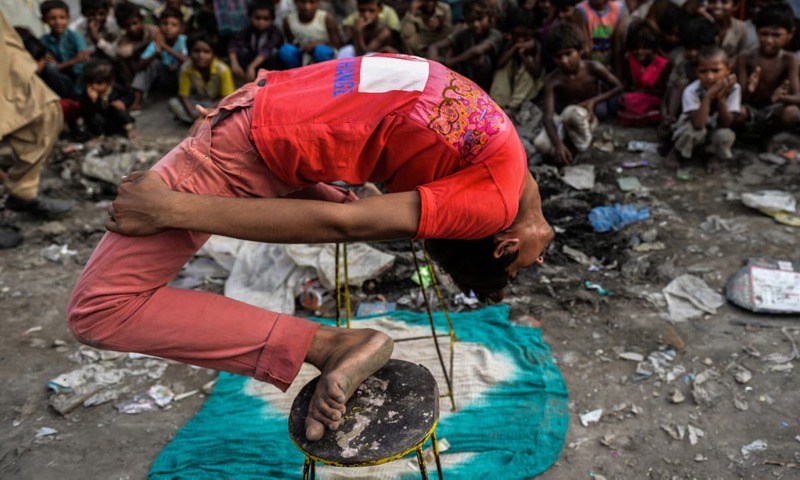 By that time, two of his sons were too old to learn body-bending tricks so he started training his youngest son, Ahmed Ali, to perform along with him — rather reluctantly because the boy had to be taken out of school. “He had to make a sacrifice for the sake of his family,” says Bahar Ali, looking at his 13-year-old son. It took Ahmed Ali around three years to train. He has been performing for around five years now. His favourite trick – that gets him the loudest applause – is one in which he stands on two metal stools, bends over, arching his back like a suspension bridge, and picks up a 10 rupee note from the ground with his mouth. The training for the trick was long and hard. When Ahmed Ali was a little child, his father would make him bend backwards while standing on a charpoy. Then he proceeded to standing on two bricks to do the bending and finally came the small wiry stools. The father-son duo build-up a lot of anticipation among their audience before they perform the trick. Bahar Ali asks a child – usually of the same height and age as Ahmed Ali – from among the viewers to come forward and stand on the stools. The child tries to balance himself but fails because the rickety stools are not balanced well on the uneven ground. Bahar Ali asks him if he will try to pick up the currency note from the ground with his mouth. Ahmed Ali immediately gets onto the stools. “How will you pick this 10 rupee note from the ground, with your hand or with your mouth?” the father asks the son. “With my mouth,” replies the son. “This will be a difficult task,” the father warns. “I will do it,” the son responds confidently, looking intently at the ground. Ahmed Ali flexes his shoulders, getting ready for the task. As another performer beats a drum, he begins to arch his back – bending over and over and over – but fails to reach the ground. He gets back up with a jerk. “I told you this will be difficult,” Bahar Ali says to him. “It is worth doing again if it is difficult,” says Ahmed Ali before he makes another attempt. The drum beats. The audience looks on with mouths agape and eyes fixed on the young performer. The boy bends his body backwards, sweat dripping from his forehead. Muscles on his face become taut with strain — and here he goes, reaching the ground, picking up the note with his mouth and coming back up on the stools in one seamless motion. The audience applauds and throws more money on the ground. The man beating the drum gets up and collects it. 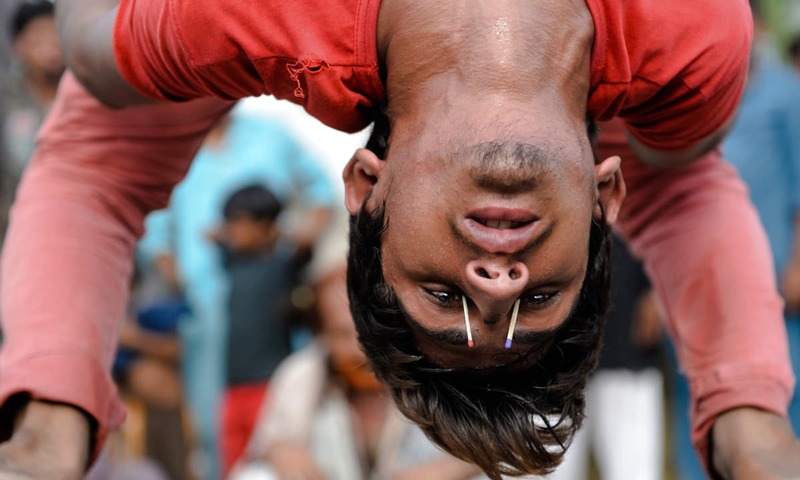 When Ahmed Ali first tried the trick at a mela – a public fair – in Faisalabad district’s Jaranwala town, he fell over and hurt his head but he finds it amusing now. “I find the trick enjoyable, almost relaxing,” he says with the hint of a smile. The mela in Jaranwala, held every spring, is a highlight on Bahar Ali’s annual calendar. Performers from many parts of Punjab get together there and exchange their expertise and experiences. “There is plenty of water to drink and bathe,” says Ahmed Ali as he explains what he likes the most about the mela. 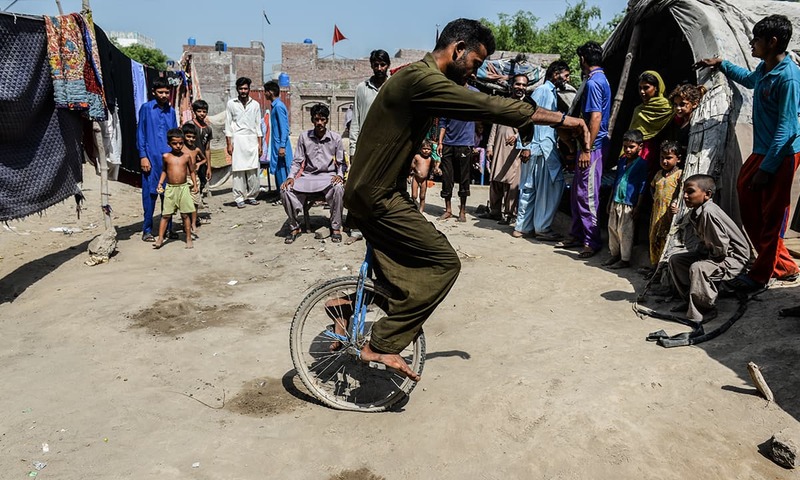 Until recently, qalandars and baazigars used to roam around the whole of central Punjab, setting up camp in open spaces and performing a variety of acts — doing gymnastics, spitting fire and creating optical illusions. Most of them have settled down in cities and towns now, mainly because they want to educate their children. Mananwala, a small town near Sheikhupura, has a large settlement of qalandars who have given up their nomadic lifestyle. Some of them live in temporary huts made from old cloth stretched over a wooden scaffolding. Others, who saved money when times were good for them, live in brick-and-mortar houses. Raqib Ali and his family are among the second group. His muscular body suggests that he has been through some serious physical exercises. He can easily walk on his hands, legs lifted straight up in the air. He can also balance a man on his head, another on his thighs and yet another on his shoulders. “These are relatively less dangerous tricks than what my father and his father used to do,” says Raqib Ali who is in his late twenties. Due to a lost appetite to learn harder acts, younger performers do not have the skills their ancestors had perfected over centuries. “We have no idea how to go about those,” says Raqib Ali. Some other acts are no longer performed because there is not enough space available. Jumping through burning metal hoops or doing acrobatics mid-air on a tight rope require large empty spaces which have been taken over by crops in villages and by roads and commercial and industrial activities in towns and cities. Raqib Ali’s family used to run its own small circus but they had to shut it down around a decade ago. His brothers have shifted to Lahore where they work as construction labourers. He himself does odd jobs throughout the year, performing only in schools or at melas — and, that too, if he is specially invited to perform. He cites security reasons for having to draw curtains on the circus. “We are often treated as a security threat,” says Khalid Husnain, another performer in Mananwala. Even reaching out to influential politicians in advance does not guarantee that authorities will allow a performance to go ahead, he says. Husnain, in his thirties, is one of the few qalandars who still maintain an itinerant work routine. Along with his son, he travels from village to village and mela to mela entertaining people. While on tour, his son is always scared of getting arrested. 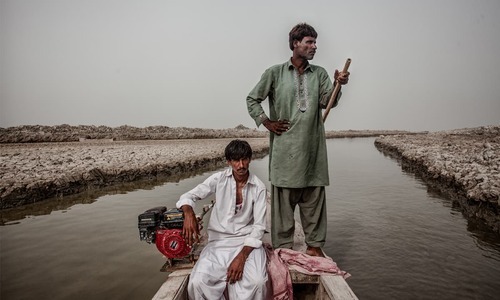 “My father was once arrested on charges of making my son do child labour so whenever my son sees a policeman, he becomes very afraid, fearing that they may arrest me,” says Husnain. He believes the shutting down of travelling circuses and religious and administrative restrictions on melas are major reasons why his profession is in a decline. 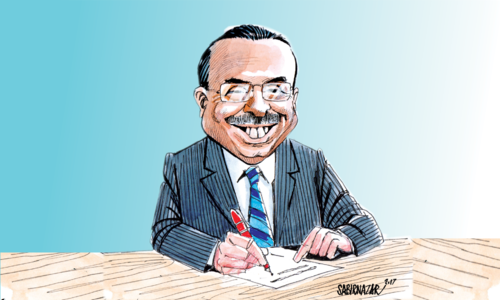 Bahar Ali points to another factor: modern technology. Cell phones and cable television, he says, have completely changed the idea of public entertainment. People can now entertain themselves in the comfort of their homes or, perhaps even more conveniently, with their handheld smart phones — whenever and wherever they like. Pakistan should show more photos of these real Pakistanis than hiding behind the over made up faces on TV. Well done Amel. I fear that in a few years, these poor performers will only be seen in photographs and old paintings... Technology is evil! Thank you for this thoroughly enjoyable article describing native indigenous life in Punjab. It isn't easy for Pakistanis living abroad to enjoy such performances . Especially not for women who can't travel easily and with great difficulty in such regions. It's easier to find people who much rather travel to Dubai and other cosmopolitan places, unfortunately one must convince them to travel within Pakistan. These acts seems cruel. How poverty make man do such painful acts, I feel sorry. Great article and wonderful photos. Love my Pakistani street performers. 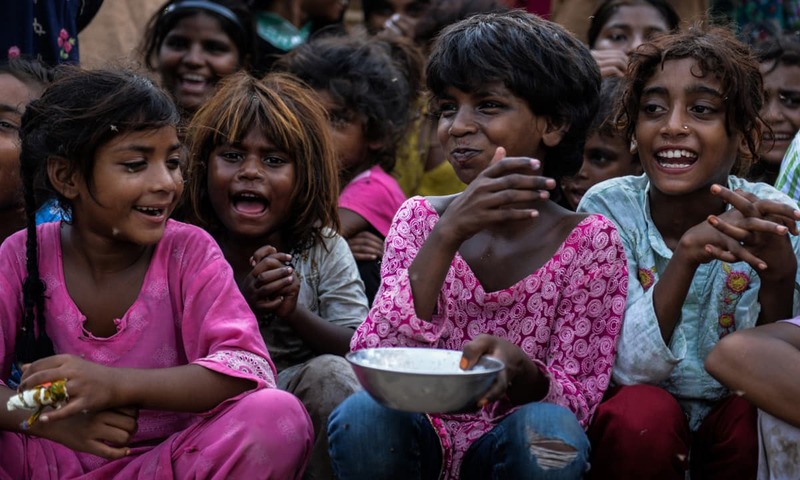 Very sad indeed, there is no deserving rewards for them and soon they will vanish as our childhood memories, I saw them in my childhood, still remember and miss them, how our next generation will see them, who can preserve them? Alas. Great article! As long as use of any and all animals like dogs, monkeys, lions, bears, etc. is strictly prohibited, the street performers should be encouraged, educated and financially assisted as they are entertainers and performers, some through generations. These are people for whom this is the only way of life and earning for their families. Kudos! These street performers and desi pehalwans can be sent overseas as part of our cultural troupes.not only they will portray a good healthy image of the country but also earn some foreign exchange.The Chinese still do this and are world famous.But,unfortunately our leaders have other priorities!